Weight Converter is an application that lets you convert between weight units. Supported weight units: ounce, pound, stone, short ton, long ton, microgram, milligram, gram, kilogram, and metric ton. You can use the weight converter to convert between weight units. For example, you could convert from ounces to grams, from kilograms to pounds, etc. This weight unit converter performs conversion between the following weight units: ounces, pounds, stones, short tons (US), long tons (UK), micrograms, milligrams, grams, kilograms, and metric tons. The weight converter stores conversion history so you can easily view and edit recent conversion results. With the Flip button (two arrows in the bottom left corner) you can easily switch between the "from" and "to" weight units. 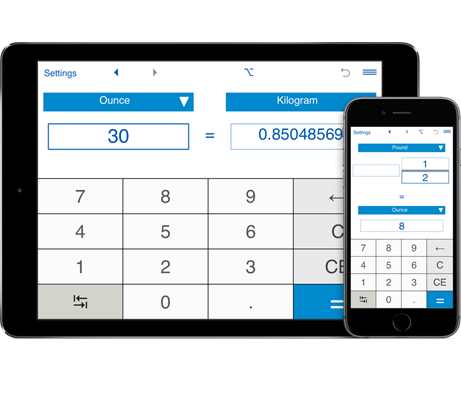 The weight unit converter supports fractional values, so you can input both decimal and fractional values. To switch to the "fractional" mode, click the button in the top menu.